The Tali Bow Pump with signature hardware is a classic design reinvented for tomorrow. Featuring Grand.ØS energy foam for all the flexibility and cushioning you'd ever really want in a shoe. Crafted in soft suede and adorned with an elegant bow and signature detailing. Suede upper with bow and hardware detailing. comfortable padding insole and stylish. fits tts and would like other colors. Very comfortable and stylish. Lots of compliments. I absolutely luv luv these shoes!!! Looks GREAT on! I just received these shoes and they are even prettier in person - the print is gorgeous and the bow detail is perfect for the holidays. I am a true 7 in shoes with a slightly wider foot and I was worried about the fit given the reviews - but I found that my exact size (7 with a B width) is absolutely perfect. They are so comfortable and aren't too snug in the toes as others have mentioned. Classic shoes worth the price - I'm actually back on the website to pick up another color! Nice job, Cole Haan. I had to go up 1/2 size, but it’s so comfortable... love this shoe! I've always loved Cole Haan shoes....I purchased my first comfortable pump [back when they teamed up with Nike]. And they were probably my favorite shoe....beautiful brown pumps which I've not seen ever sense from anyone. I love animal print shoes they never go out of style. 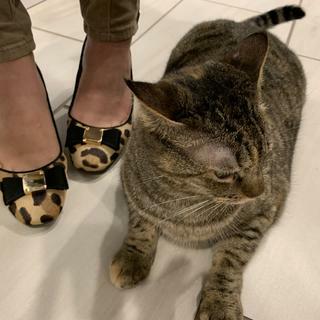 I have all different types of animal print shoes but none with bows on them. I thought they gave a classic shoe an even further feminine accent by adding the bow. And I love the classic background color with the black spots. Can you remove the bow? BEST ANSWER: The bow is not removable. I purchased this shoe last spring in pink with the bow. It is super cute and I received many compliments on the shoe. Tebow was not designed to be removed.Enter an answer to this question. No, the bow is not removable. No. The toe box is narrow.